Well, it’s certainly been far too long since I last shared a recipe. But don’t worry folks, I’ve been stocking up the photos on my camera and recipes in my Moleskine. I’ve got tons of stuff to share! The holidays were brutally busy this year, so blogging had to take a back seat. Fortunately, eating and cooking remained a huge priority. The waistband of my jeans is proof of that. So as most of us do over the holidays, I overindulged a bit (a lot). Because of this, I’m trying to focus on recipes that are a bit healthier. And I do usually cook pretty healthy, so by “healthier” I mean minimal usage of the gluten-free “frankenfoods” (i.e. fake pasta, bread, etc.). Anyway, for dinner tonight I decided to make something that’s been concocting itself in the back of my mind for a week or so. These ingredients together just sounded like they would be so delicious, so I went for it! And I was pleasantly surprised. You can make pretty much any dish “Caprese” and I will probably eat it. 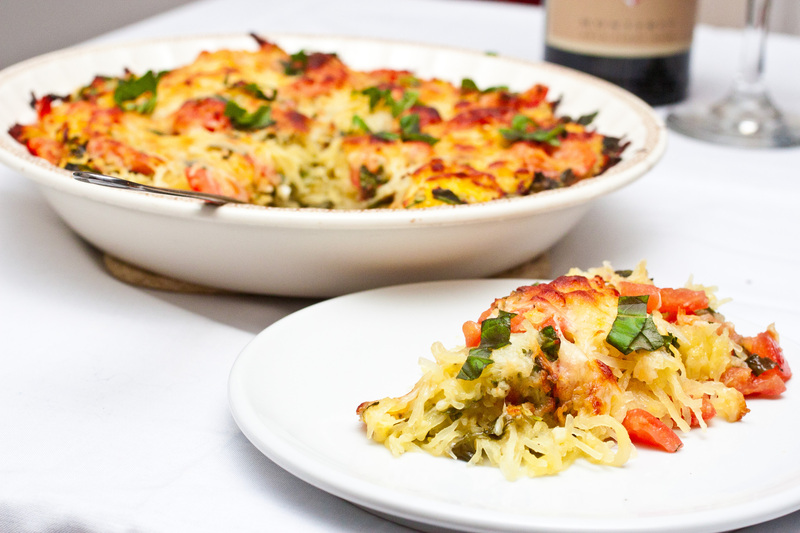 Also, if you like this recipe, I’ll bet you’ll LOVE my Guiltless Alfredo Spaghetti Squash Bake! It’s become a regular dish in my house…perfect for a low calorie (but doesn’t taste low-cal) weeknight dinner. 1. Pierce squash several times with sharp knife (to avoid squash explosion). Bake on a cookie sheet for 1 hr 20 min at 375, flipping squash once halfway through. 2. Pierce squash several times with sharp knife (again, no spaghetti bombs). Heat in microwave on a plate for 10-12 minutes. Once your squash is cooked, slice off the very end with the stem. Then, halve the squash lengthwise. Scoop out the seeds and gooey bits and throw those away. Scrape the remaining flesh of the squash with a fork to get out all of the wonderful spaghetti noodles. Place noodles in a large bowl and set aside. Mince garlic. Cut tomatoes into bite-size pieces. Roughly cut basil and spinach leaves. 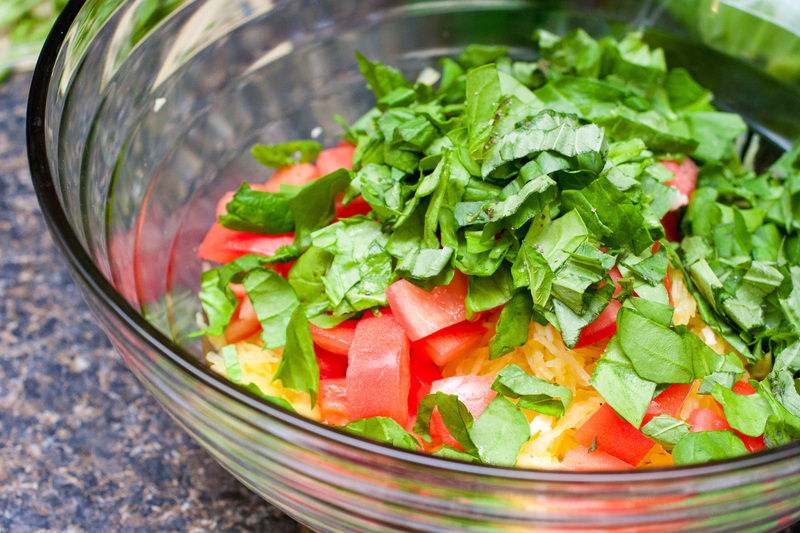 Place all of these ingredients, along with the olive oil, into the large bowl with the spaghetti squash. Mix well, then season with salt & pepper to taste. Then stir in 3/4 cup of shredded mozzarella. Add this mixture to a pie dish or 1 quart-ish baking dish and spread the top smooth-ish. Sprinkle the remaining 1/4 cup of mozzarella over the top. Bake at 375 for 30-40 minutes or until cheese on top is lightly browned. Top with additional fresh basil, and serve! That looks both comforting and classy, and your photos are gorgeous! 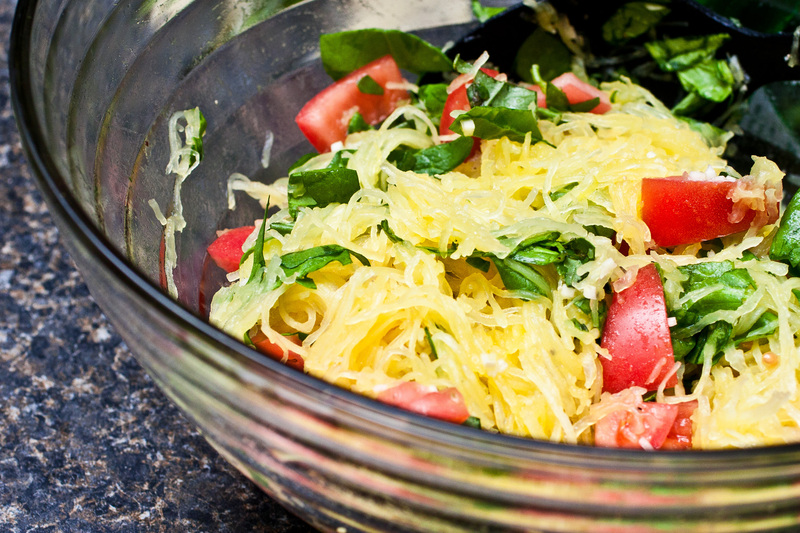 I’ve never worked with spaghetti squash before, but I’d love to try. Do you have any tips? 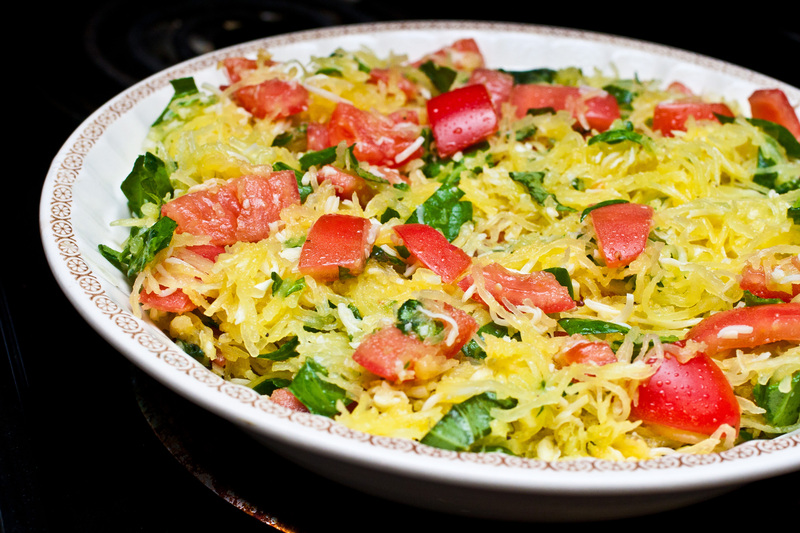 Spaghetti Squash always intimidated me at first, but once I started working with it, it turned out to be pretty easy. My main tip is to bake it whole, and don’t try to cut it before baking. Raw spaghetti squash might as well be a rock, so your best bet will be to bake it in either the oven or microwave, then cut it. The squash does have a taste to it, but even so it’s still pretty bland so you can really add anything to it that you want as far as seasoning and ingredients! It can replace pasta in any dish imaginable and will still taste pretty good. If I zap it in the microwave, do I cook it in a similar way as in the oven, just for a shorter time? The strands do look like spaghetti, so I’ve wanted to try it as a way to incorporate more vegetables into dinners. Thanks for all of the tips!! I do that with regular and sweet potatoes… When I get cravings, I’m too impatient for the regular oven! Me too! Can’t remember the last time I made a potato in the oven over the microwave. Me either… Probably at some family holiday dinner, but then it definitely wasn’t me who cooked them! Hi Melissa! I’d say it makes about 4 servings. The dish I made it in is a standard pie dish, for reference. This was delish. I added red and green peppers, mushrooms, artichokes, olives, extra garlic, a little pesto, and Italian tomatoes. It was a hit. Are you able to add a “Print” button to your recipes that will just print the instructions? Otherwise, you have to print about 10 pages or handwrite the instructions after page 1. Just a thought and I’m excited to try this recipe tonight!! Shelly, that’s a great idea! I’m not sure if WordPress will allow me to add a button like that. I’ll certainly try! Hope you liked the recipe!! I made this for dinner and served it with BBQ Chicken. Fantastic! 🙂 Thanks so much! I didn’t have fresh spinach, so I left it out and it was still great. This is definitely a “must try” recipe. Pictures are great and tempting! I’ve worked with spaghetti squash before, but never like this. I cut the upper end and halve the squash lengthwise; take the seeds out and submerge halves in salted boiling water for about 7-10 min (depending on the size, temperature…). Add wine or any kind of broth to the water for extra flavor. Scrape the flesh onto a plate and pour spaghetti sauce, veggies, meatballs and cheese. Done! For variations, marinate cooked “noodles” in balsamic vinegar, olive oil, salt & pepper for about 1hr. Alternatively, you can choose any pesto of your like. Mix in sliced vegetables or meats (if they are grilled, even better!!) and you have a summer salad. Another option: Mix noodles with mayonnaise, shrimps, petit pois, pickles, little cheese cubes, “sofrito” and “dulce de piña” (cooked pineapple in sugar, water and a sip -or 2- of rum) for a tropical twist! I love your method!! I’m definitely going to have to try it…I bet cooking in wine or broth takes it to an entirely new level. How many net carbs per serving? My apologies for taking so long to reply! I didn’t calculate nutritional content during my first round of making this, but I plan to make a revision of this recipe soon, and will calculate the values then and re-post. I know its a little late, but what are the nutritional values of this dish? My apologies for taking so long to reply to this! I did not take note of the nutritional values in my ingredients at the time of cooking, but I plan to make a revision of this recipe soon, and will take down the values then and re-post. p.s. 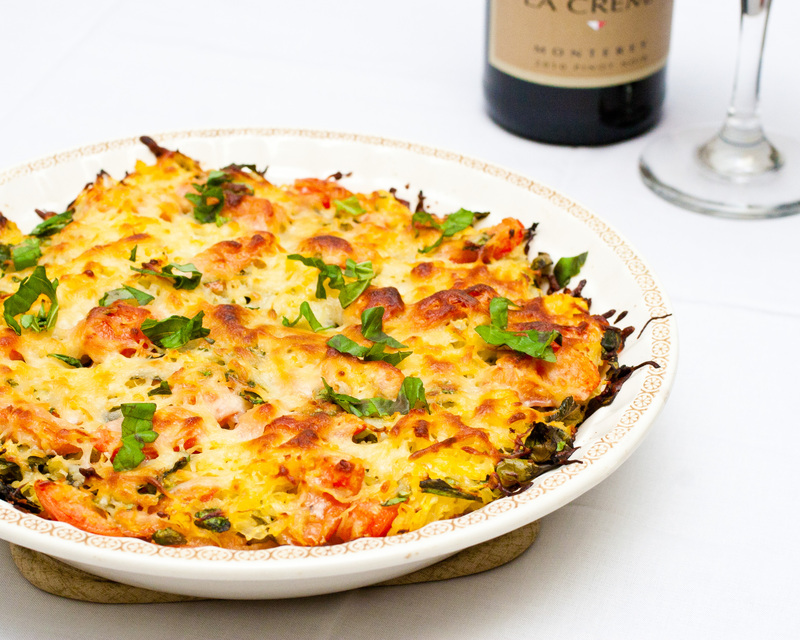 Everything is a little bit better with some melted cheese! Had it tonight. It was EXCELLENT. I just have to play around with the spices a bit. I used Kraft fat free shredded mozzarella, and there wasn’t a need to put oil in it so I didn’t 🙂 Next time I think some small cut broccoli florets would go nice with this, too. 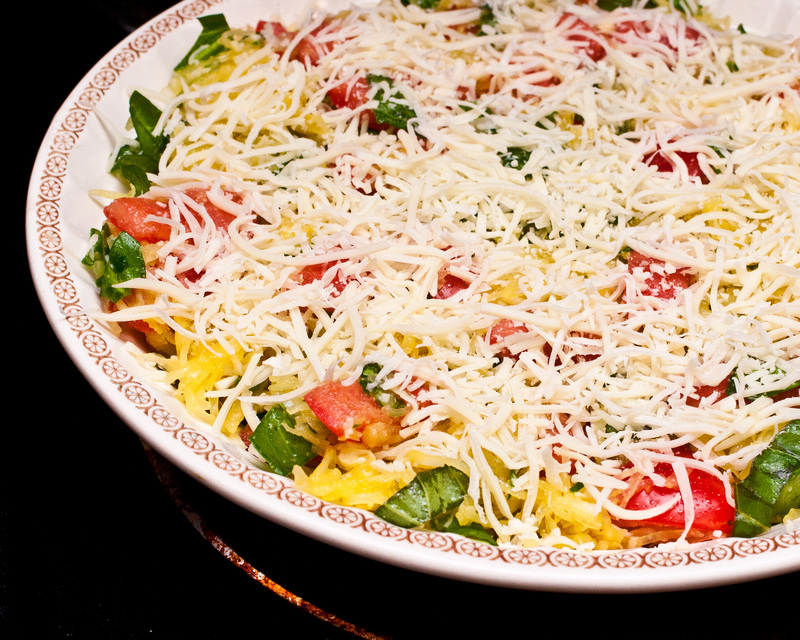 It is an easy dish to play around with – adding different veggies. 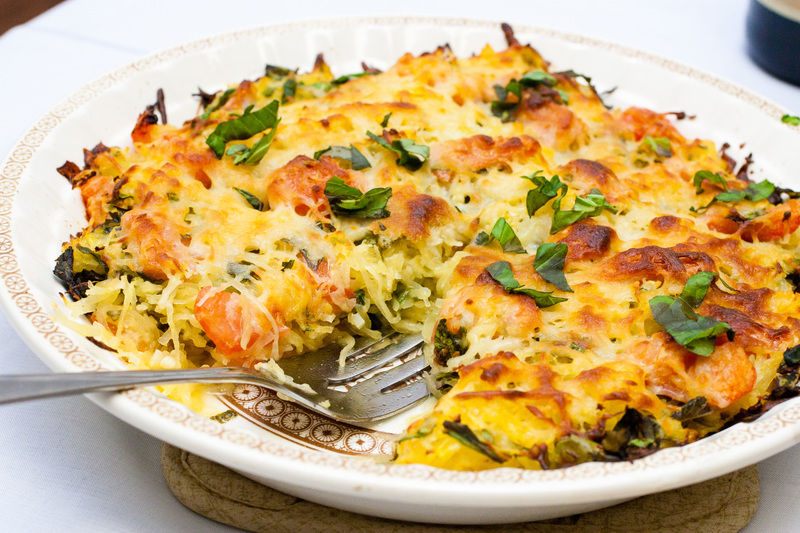 Hey, I just thought of this, splitting the spaghetti squash into two pie pans and adding meatless crumbles (I don’t eat red meat, turkey and chicken seems to be on it’s way out). That will make it a meal that will have the protein built in. 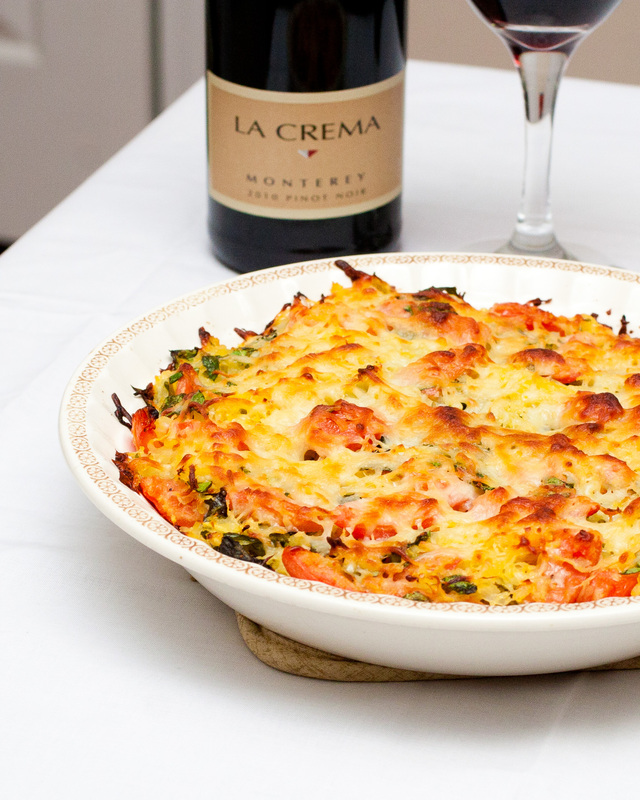 Spaghetti squash and La Crema… awesome! going to try this. Sounds yummy. Has anyone tried to make it the day before.? I’m throwing a dinner party and thought I’d serve this- but too much going on day of the party. So I’m trying to get as much done before as possible. Thoughts?? Awesome! I have yet to make it the day before, but I’m sure you could mix everything up, put it in the pan and store in the fridge overnight, then just pop it in the oven before dinner. Good luck…let me know how it goes! Sounds yummy! I love spaghetti squash and nooch. But, don’t throw those seeds away! They are delicious roasted like pumpkin seeds and nutritious!